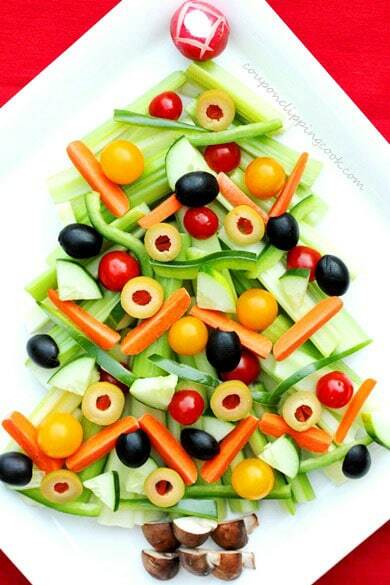 Here’s a fun way to make a holiday relish tray, in the shape of a Christmas tree. This is a great idea for kids too. What fun it is to decorate a tree when you can eat pieces of it as you go along. 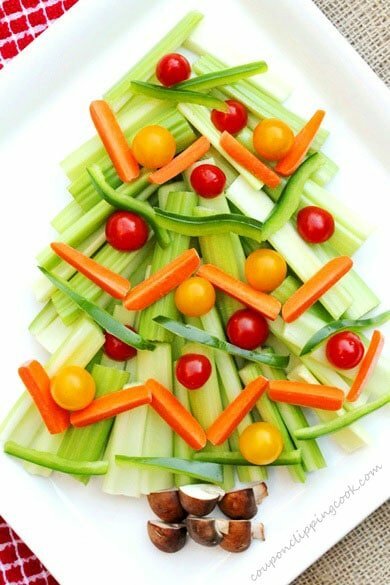 And Christmas trees made out of veggies are healthy. 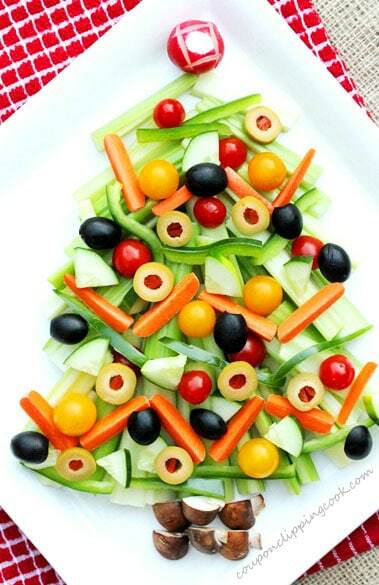 The best part is that you can use your favorite relish tray items to decorate this tree. It can be customized to include the vegetables of your choice. 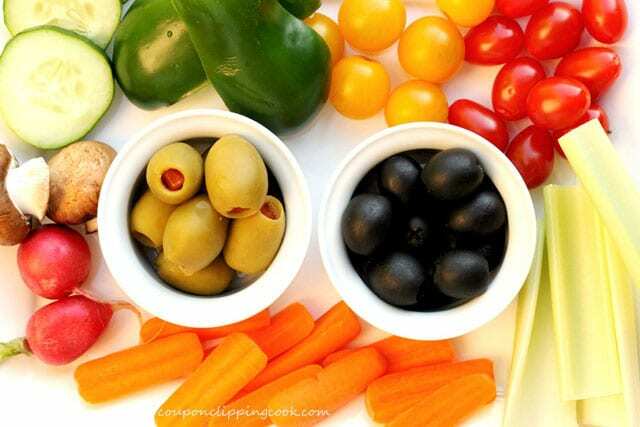 This relish tray can be made ahead of time and is perfect for when you need to bring an appetizer to a party and it’s sure to be a crowd pleaser. 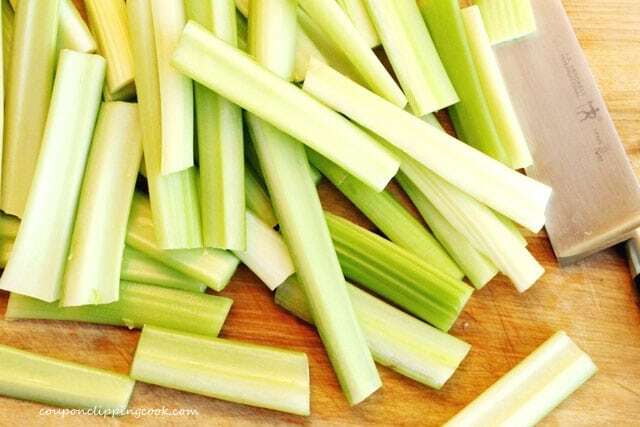 Cut the celery into sticks (various sizes are fine). 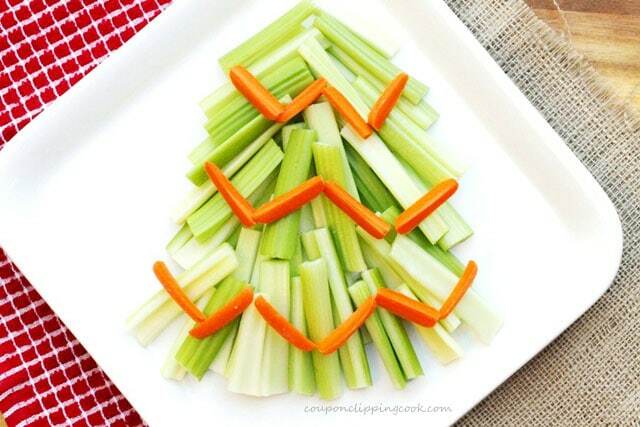 On a large flat plate, lay out about 8 celery sticks in the shape of the tree top. Make sure to leave enough room for the tree top decoration. 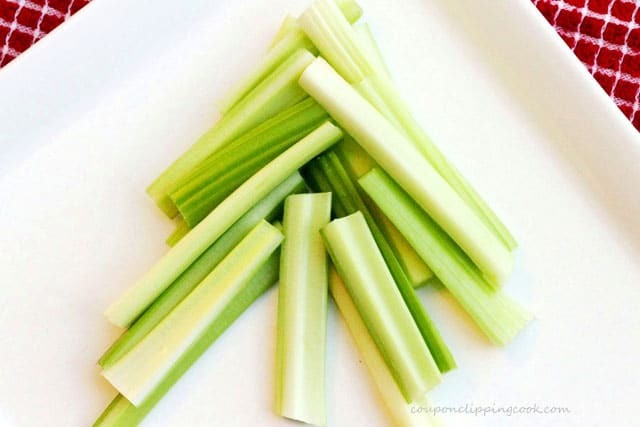 Continue to lay the celery sticks on the plate to form the entire tree. 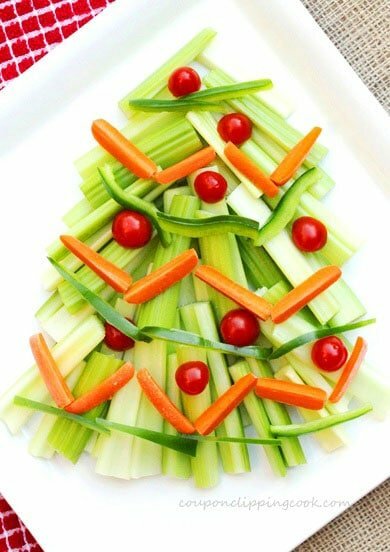 Then fill in the tree with celery sticks. 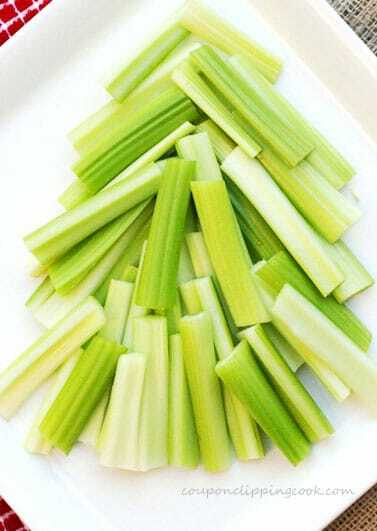 Lay out the celery so some have the light colored sides up and others have the dark sides up. 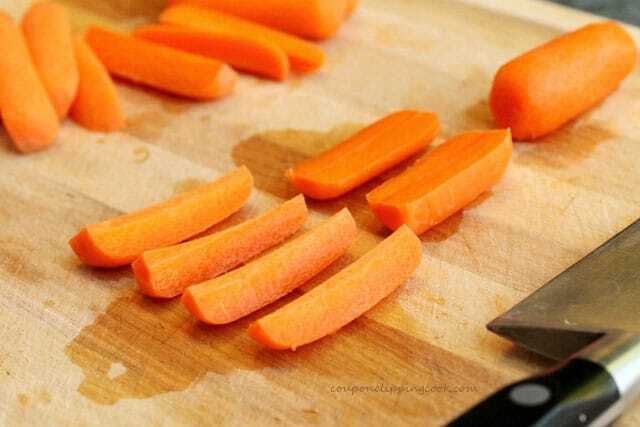 Cut the carrots in quarters lengthwise. 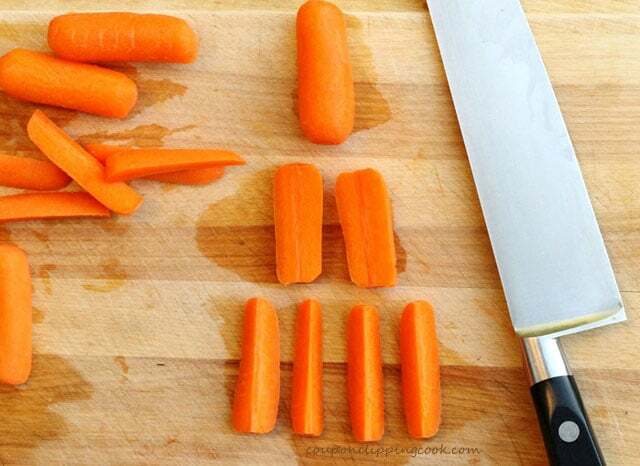 If the carrots are large you may need to cut them into 5 pieces instead of 4. 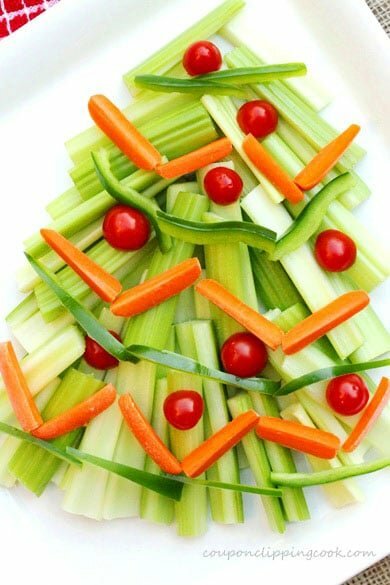 To make the carrot garland, lay out the carrots about 2 inches from the bottom of the tree in a zigzag direction. The bottom string of carrot garland should take about 6 pieces of the cut carrots. Next, about two inches above the first string of carrot garland, lay out about 4 pieces of carrots in a zigzag shape to form the second string of garland. Then about two inches above the second string of carrot garland, repeat to make the third string of garland up towards the top of the tree. 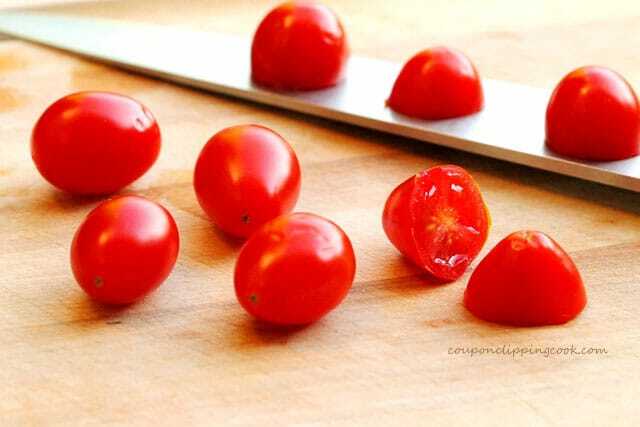 Cut the tomatoes in half width-wise. Then add the cut tomatoes smooth side up to the tree to make ornaments (if you have enough tomatoes, an option is to use the non-stem half only, which looks prettier as an ornament). Next, cut a quarter piece off of a whole green bell pepper and cut about 12 very thin pieces that are about 3 inches long. Lay out 4 rows of the thin pieces of bell pepper in between each strand of carrot garland to make the bell pepper garland. The green bell pepper garland can be laid out straight rather than in a zigzag direction. 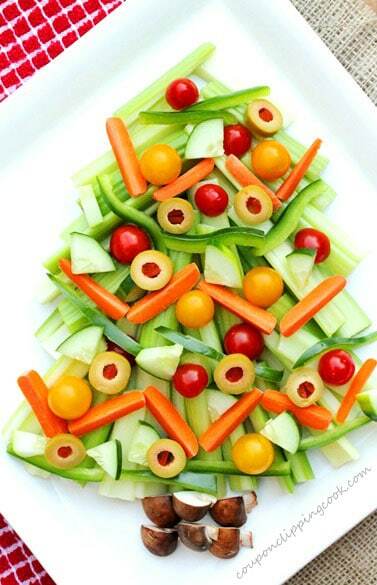 Lay the yellow cherry tomatoes on the tree as ornaments (no need to cut them). Next, cut the mushrooms in quarters. Then add 6 quartered pieces to the bottom of the tree to form the trunk. Cut cucumber slices about an inch thick (with the skin on). Then cut each slice into quarters to form 4 triangles. 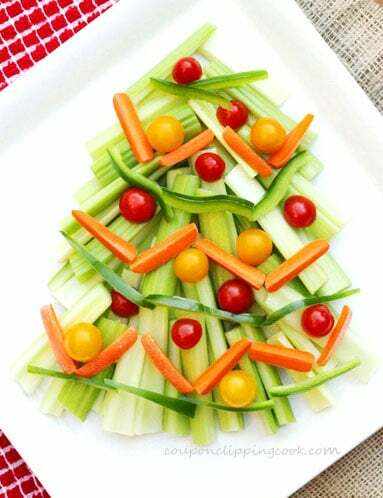 Lay out the triangular pieces of cucumber on the tree as ornaments. Then cut the green olives into about ½ inch thick slices and lay them on to the tree as ornaments. Next, cut the black olives in half lengthwise and lay them cut side down on to the tree as ornaments. Lastly, make a rosette out of the radish and use it to top the tree. Serve with your favorite dipping sauce and enjoy. For the Radish Rosette Tree Top Decoration - Out of a large size radish, make a rosette and add it to a small bowl of ice water so it will open up. Set aside. Please refer to this post for directions on how to make the rosette "Pumpkin Head Relish Tray". 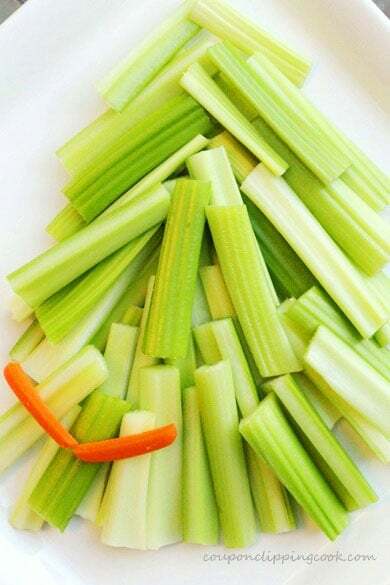 For the Tree - On a large flat plate or platter, lay out about 8 celery sticks in the shape of the tree top. Make sure to leave enough room for "ornament" that goes on the top of the tree. 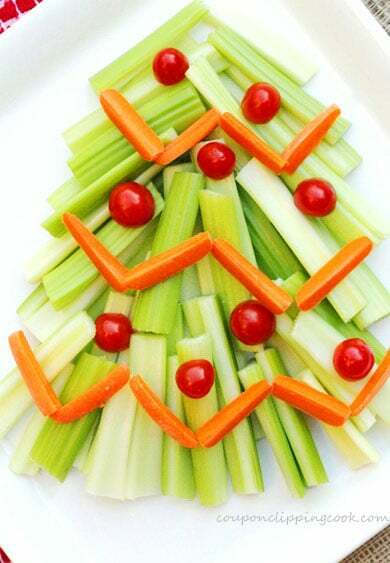 Then fill in the tree with celery sticks. 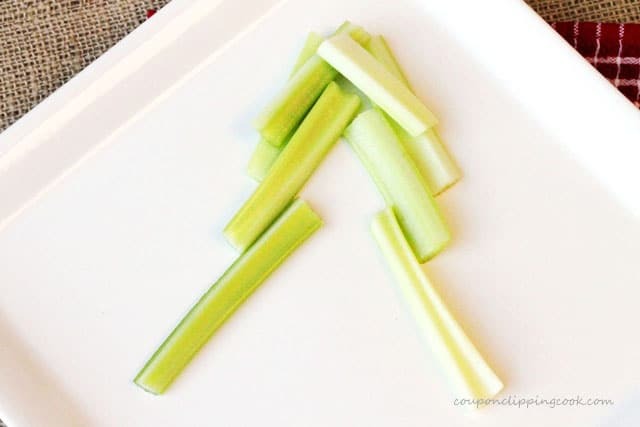 Lay out the celery so some have the light colored sides up and others have the dark sides up. For the Carrot Garland - Lay out the carrots starting about 2 inches from the bottom of the tree in a zigzag direction. The bottom string of carrot garland should take about 6 pieces of the cut carrots. For the Green Bell Pepper Garland - Lay out 4 rows of the thin pieces of bell pepper in between each strand of carrot garland to make the bell pepper garland. 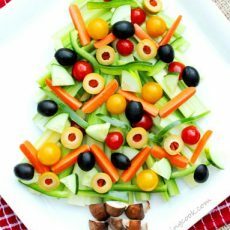 For the Tree Decor - Add the cut red tomatoes cut side-down to the tree to make ornaments (if you have enough tomatoes, an option is to use the non-stem half only which looks prettier as an ornament). 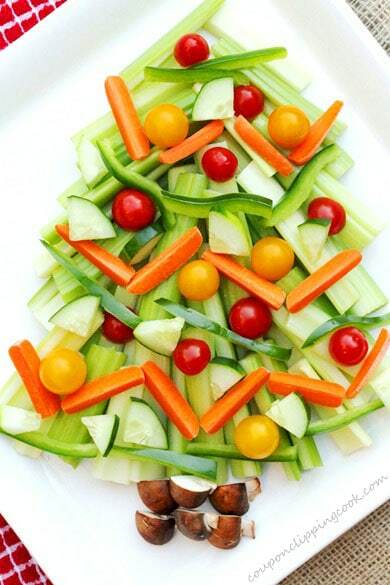 Lay the whole yellow cherry tomatoes on the tree as ornaments. Cut the mushrooms in quarters. Then add 6 of the cut pieces to the bottom of the tree to form the trunk. 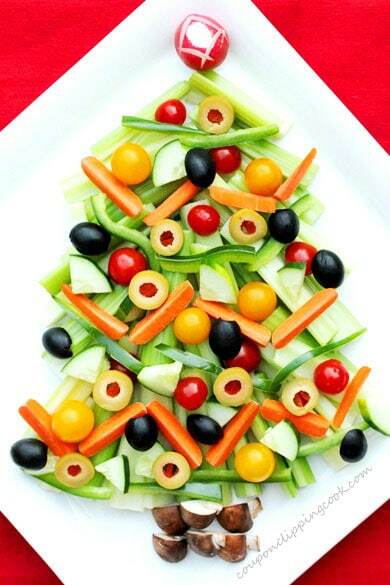 To the tree, lay the green and black olives (rounded smooth side up) on the tree as ornaments. Lastly, to the top of the tree, add the radish rosette. Hi Jana, thank you for the link. Sounds like the fruits would be so cute as a Christmas tree. Looking forward to checking that out. Have a great day! I love this idea! I tried something similar at Thanksgiving when I tried to to make a turkey out of relish veggies…but it most definitely was not the success story of the day. A Christmas tree is a much better idea! Hi Denise, so glad you like it. How cute the turkey must have been made out of relish veggies. Have a nice holiday! Love it. 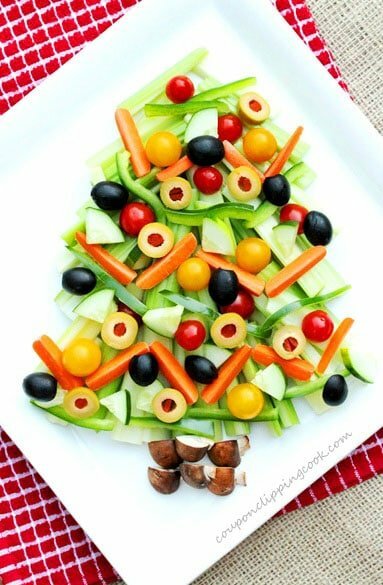 I was thinking of doing one of those broccoli/carrot/tomato trees I’ve been seeing everywhere, but I really like the look of this one instead. Yum. Hi Jessi, so glad you like it. Have a great day. This is awesome!!! And your step by step photos and directions were so detailed. I am bringing this to my Christmas dinner. Oh, best of all…it’s healthy. Thanks! Hi Marty, so glad you liked it! Have a great week! LOVE this it’s so pretty and colorful! Hi Diane, thank you very much.